This is more of a "how-to" guide on sweat lodges, so it mostly deals with the physical aspects of building and having a sweat. For the spiritual side, you'll have to try better sources than myself. This page is mostly notes on doing a sweat as I was shown by a Yakia friend of mine that is well known for his traditional sweats. An important thing to start with is the right location. 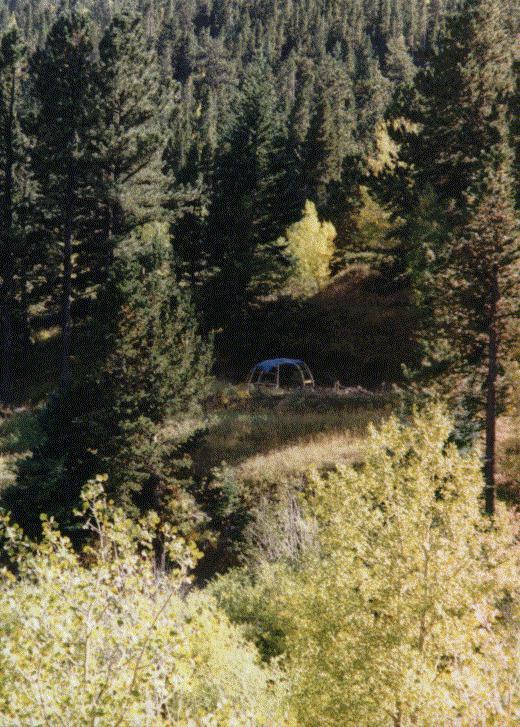 This is a picture of the sweat lodge from across the ponds. We found this site by walking around and looking for anything we could consider a good sign. At this spot there were numerous trees that had been chewed by the beavers in the pond. That combined with a nice view of the ponds and the mountains, plus good access made this the perfect spot. We knew we had the right spot when we found a hummingbird nest in the tree by the fire pit. My friend Felippe' related a story of how he had been woken up by a hummingbird outside his window that morning, and we felt it was telling us this was the right spot for our sweat lodge. At later sweats I've heard the beavers come out and slap their tails on the water, and the coyote's crying in the night. This seems to me to support the spot that we chose was a good one. This is the fire pit after cleaning, and before building the fire. In the center is the sage we sat on in the previous sweat. The logs were buried in the pit as I'll describe below. The fire pit starts as a hole 3 feet across, and about 2 feet deep. The dirt that is removed is used to built up the sides of the fire pit, as the flames can get pretty large. In the hole in the very bottom, we stacked cord wood (large logs, 3-6 inches in diameter) in the hole to act as a bottom layer. The whole fire pit was about 5 feet across, and 7 feet long, with the sides about a foot tall. Now that this sweat has been used a bunch of times, the sides have gotten much higher. This shows the rough layout of our sweat area. On the right is the piles of fire wood. We find we need roughly 2 piles of logs about 3 long, in a pile about 4 feet long, and 3 feet high. In front of the wood pile is the fire buckets. We always keep 4 buckets of water around in case the fire gets out of control. We've never used it, but after fighting forest fires in Wyoming in 1994, none of us wanted to risk things getting out of control. 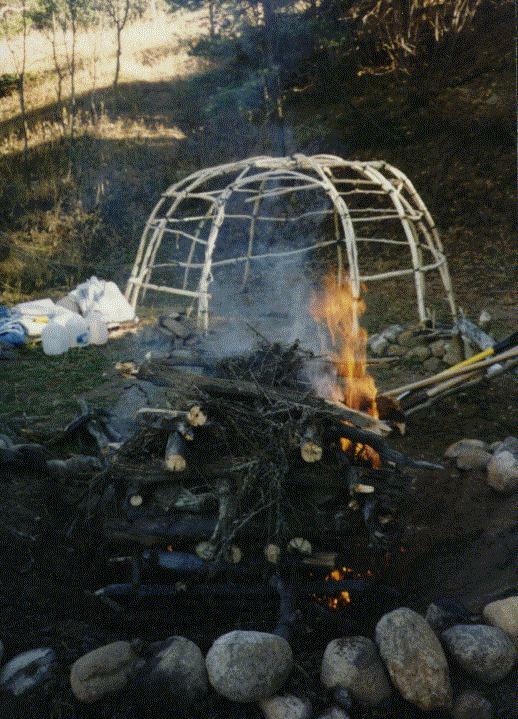 The fire pit is to the left, with the uncovered sweat lodge behind it. The dor of the sweat lodge faces to the NW in this case. Just out of site between the fire pit sand the sweat lodge is the altar, you'll be able to see it better in other photos. Here you can see the frame for the first time. This frame was made out of green aspen trees with their bark pealed off. 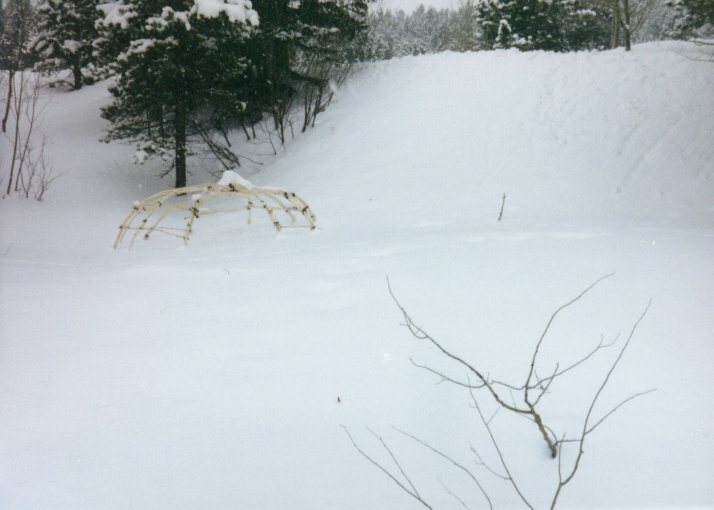 The frame is about 10 feet in diameter, with a shallow depression 6 inches deep, and 2 feet across. The ends of the trees were buried in the ground, and bent over and then tied with cord. The frame is pretty sturdy, although I wouldn't want to sit on it. The fire is built as a box, using the longest logs. This is built on top of the cord wood as show in the first picture. The bettom layer of the fire hs to support the weight of the rocks and the fire without falling over. It's started as a box, with the corners facing the fours directions. It's about 3 feet sq., and built with some of the biggest logs. In the middle of the box is built a teepee fire of kindling, and the whole box is then filled in with pine cones and pine nettles. This layer is about 2-3 feet high when done. It's then topped off with a solid layer of decent sized logs. On top of this the rocks (we use about 27 per sweat) are piled into a dome, and then another box of smaller logs is built around the rocks on top of the lower layer. This layer is built up another 2-3 feet, so the whole log pile is about 5-6 feet high. This is why the pit needs to be deep and wide. This upper box is then also filled also with pine cones and nettles. Throughout the whole structure is the sage from the previous sweat, with the final handfulls going on the very top. The fire is then lit the fire with a burning smudge stick (we used sage, we have lots of it growing around here) at the four directions. This pictures was taken as it just started to light. 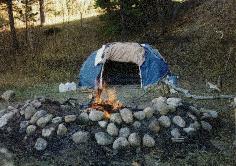 The idea is to build a fire for the coals, as you want to really cook the rocks. The bottom layer becomes the coals that the rocks sit in. A good rule of thumb is you can always add more wood on top of the rocks, but you'll never get a chance to put more logs under the rocks. Here's also a better view of the frame. It's got three horizontal sets of additionsl sticks tied on for bracing. The center hub is also tied together. Tied at random intervals throughout the sweat are little pinches of tobaco in cloth scraps. These are offerings. Here's another picture of the fire after it was lit. 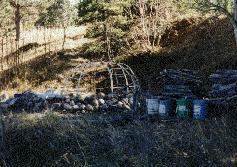 Here you can see the U shape of the fire pit, with the wood pile and water buckets behind it. The opening faces the door of the sweat lodge. It's from this opening that you drag the rocks out. The log behind the fire pit is a fence between the altar and the fire pit. Only fire tenders are supposed to step over it during a ceremony. The sides of the fire pit are covered with the rocks from previous sweats. We try to not reuse them, and as most get pretty cracked, they wouldn't work good anyway. When we clean out the fire pit, we spread the ashes and coals on the sides of the fire pit. Then the stones from the last sweat get piled on top. Here's the fire after burning down. 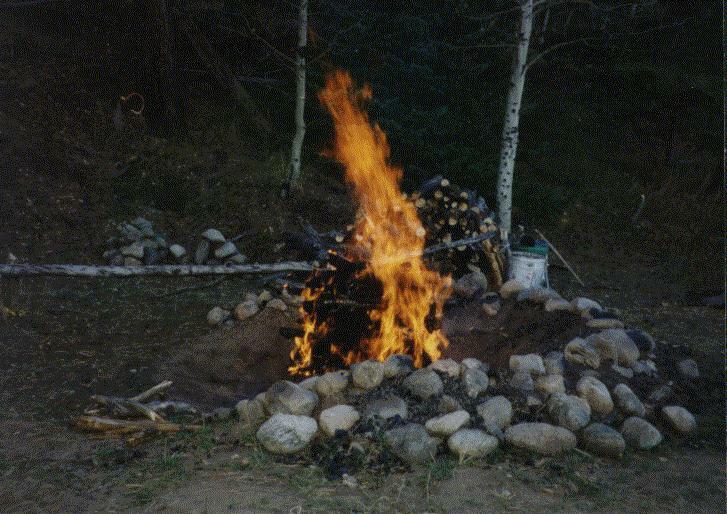 The fire has to burn around a minimum 3 hours for the rocks to get good and cooked. The sweat has been covered while the fire burns. The three jugs are for drinking water to be used during the sweat, and the blue bucket on the right it for splashing on the rocks. The sweat is first covered with a layer of sheets, then blankets, and finally tarps. The bottoms of the layer should lay on the ground for about 6-8 inches. Pile rocks on the bottoms, all around the sweat lodge. This is to seal the bottom up from drafts. The door is several folded blankets wider than the opening. The corners of the blankets are tied together, and ropes tie the corners to rocks or pegs on the other side of the sweat. This acts as a hinge. We also tie the tarps down real good, as we get pretty strong winds here in Colorado. This was taken at dusk as we were about to get started. Here the fire has been stoked up to keep the next round of rocks hot. Just to the left of the sweat lodge, you can see the altar. The altar is made from the dirt that comes out of the hole in the sweat for the rocks. On it we all place special things for the ceremony. Our altar usually has sweet grass on the pipe holder, some feathers, some ancient pottery shards from the four corners, ashes from Felipee's previous sweat down at Big Mountain, and other objects. Off to the left are piles of rocks. We try to keep a few piles of rocks, each enough for one full sweat. This way we can do sweats in the winter, when snow is everywhere, and rocks are hard to find. You can see the wood pile has been burned down considerably during the last 3 hours. Here we're looking towards the north star. overlooking the beaver ponds, and looking up the valley towards the house. Before going in the entire floor of the sweat is covered in fresh sage. This is kinda nice, as it keeps you out of the dirt some. We then put the drinking jugs by the door so we can grab them, and the bucket full of water goes by the door also. We'll put both inside before we close the door. And just for a change of pace, here's a final picture of our sweat lodge during a cooler, more quiet period. We typically don't use the sweat during the winter as it's buried in deep snow drifts. Winter is pretty intense here at 8500 feetin the Colorado Rockies. I don't feel I can adequately describe the feelings I go through when doing a sweat, or the thoughts that run through my head. So I'm gonna keep this to the basics. I know of two styles of sweats. One is the the traditional sweat, and the other my friend calls "New Age Sweats". I refuse to make a judgement here on the net, so I'll elaborate on both. Common to many styles of sweating is the idea of spiritual cleanliness. Many sweats start with all the participants fasting for an entire day, and during that entire day avoiding caffine, alcohol, or other potentially altering sunstances. This should be a day of contemplation, in preparation for the sweat. At this point the styles diverge somewhat. Traditional sweats aren't usually done "sky-clad", and most new age sweats (at least in the Rainbow Family tradition) are done naked. A towel or a pair of shorts is more appropriate for a traditional sweat. 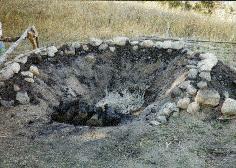 Once everyone enters the sweat lodge, the fire tender puts 7 rocks in the small hole in the center of the lodge. As each rock is put inside, people sprinkle cedar on the rocks. The buckets are put inside, and the door is closed. In a traditional sweat, there is more guided prayer, chanting, and drumming. I've also been in sweats that were 100% silent. I like both, and appreciate them for their differences. Each round lasts around 45 minutes or so, and afterward the door is opened, and the fire tender puts 5 more rocks in. In traditional sweats, the idea is to not get out between rounds. Many folks that are new to sweating may need a short breath of fresh air, and get out for a few minutes between rounds. 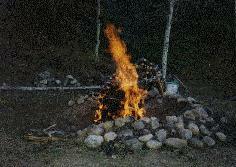 I find a pitch fork and a long rake work good for getting the rocks out of the fire. I rack them out towards the edge, right up onto the pitchfork. That way all the coals get left behind. Coals make the sweat smokey, and hard to breath. Ashes are brushed off of the rocks with a pine branch. Once again all the rocks are sprinkled with cedar as they're put in the sweat. During each round the temperature is regulated by how much water is put on the rocks. It goes both ways though, cause the water also causes the rocks to loose their heat faster. So hot short rounds, or long cooler ones are the choice. Sometimes water is splashed on the participants during a really hot round, but this has a tendency to make things muddy and messy. Traveling around, I've seen other sweat lodges. Here's a few of the others I've visited (but usually haven't sweat in). A few of these are some pretty interesting non-traditional designs. This one is at the Annual Rainbow Gathering, which was in Kentucky this year. Picture by Owl Talking. 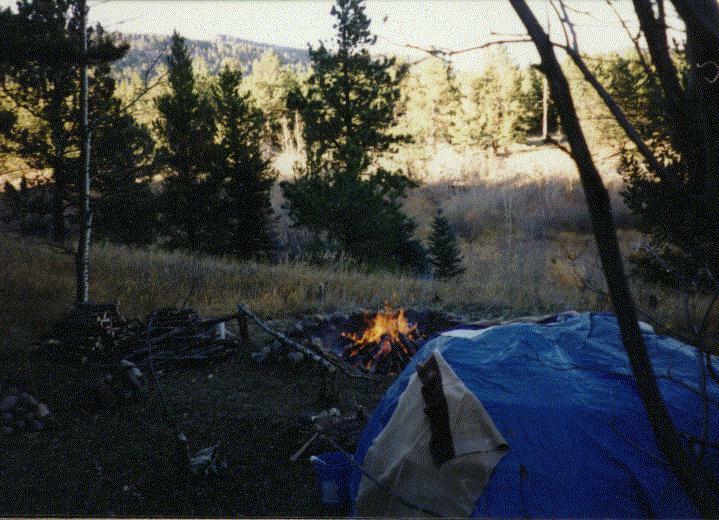 This one was in the mountains of Colorado at Herring Park, in San Isabel National Forest. This one was in the mountains of Colorado, in Pike National Forest at Wigwam. There was a large pit pit near by. and one night folks were sweating during a huge drum jam. The sweat was vibrating with the sound of all the drumming. Another one was in the mountains of Colorado, in Pike National Forest at the base of the Buffalo Peaks. Beth Moscov wrote this poem in March 1993 after a women only sweatlodge ceremony on the spring equinox. 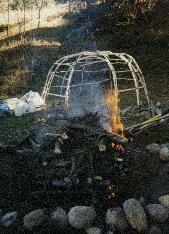 A site with some other interesting info on constructing a sweat lodge.